Few dogs, large or small, are so striking in appearance (and regal in bearing) as the Pekingese, the “Lion Dog” of China whose aristocratic roots go back thousands of years. Full of personality, and happy to lounge on lap and sofa in the company of its owners, the “Peke” has been a popular breed in the West since the late 19th century. Whether you’re taking yours on a slow-paced round-the-blocker, or welcoming a few guests over at the house, the Peke’s plush getup, trademark rolling gait, and out-sized personality are bound to impress any who clap eyes on it. Evidence suggests the Pekingese is among the oldest known dog breeds. It was bred as an imperial lapdog and temple spirit at least as far back as the Tang Dynasty in the 8th century. The Peke is traditionally associated with the Buddha, who – one foundational tale goes – miniaturized a great fierce lion to create it. Many a “Foo Dog” statue (the American Kennel Club notes) depicts the breed, which was sometimes toted around in the sleeves of royalty. The Shih Tzu – which shares the Peke’s “Lion Dog” moniker – was another lapdog of the Chinese aristocracy, and resembles the other with its similarly squashed-in face. Pekes first spread from the palaces and temples of their homeland in the mid-19th century, after the British invaded Peking (the former name for Beijing) in 1860 during the Opium Wars, and sent five of the royal Lion Dogs back to England as an exotic gift for Queen Victoria. An immediate hit there, the Pekingese ended up reaching the USA by the end of the 1800s. The American Kennel Club registered its first one in 1906. In 1912, a lucky Peke gained worldwide renown as one of the three on-board dogs to live through the disastrous sinking of the RMS Titanic. The stubby face and luscious coat of the Pekingese are its defining characteristics – along with, certainly, its petite dimensions: It stands less than 10 inches tall and weighs about 14 pounds or less. The Lion Dog indeed looks like a drastically shrunken male lion, what with the rich mane cloaking its nape and shoulders and broad head. Less nobly, you could almost describe the breed as a mobile mop, though the coat is (ideally) of much finer and smoother strand. The Peke’s forequarters are heavier than the hindquarters – another rather lion-like trait – and the lions are narrow; the topline runs about level. Ears and forelegs come well feathered. Pekingese appear in a wide variety of colors, from red, sable, cream, and golden to pure black or white. “Bred to live in palaces,” the American Kennel Club writes, “[Pekingnese] can be as serenely independent as the emperors who owned them.” These are indeed proud, self-assured, even slightly haughty lapdogs with no small amount of charisma. Accustomed to the “lap” (as it were) of luxury, Pekes are cheery, affectionate dogs who love relaxing and otherwise spending time with their families, toward whom they are exceptionally loyal. Pekingese can do fairly well with older kids, but not children who are overly rough with them or who invade their personal space when the (quite territorial) Lion Dog is claiming food or a toy. For these reasons – not to mention the breed’s bit of a jealous streak if it feels it isn’t the center of its primary caretaker’s attention – Pekes don’t tend to live well alongside toddlers and tykes. Pekingese are seasonal shedders, and their royal lion’s-mane coat does require some TLC. Brush it at least several times a week if not daily, and have it professionally groomed a few times a year. As with other long-haired dogs, keeping your Peke in a svelter “puppy cut” reduces the grooming maintenance somewhat. Regular brushing will help you ward off the matting that a Peke’s long hair is prone to if left untreated. Tackle any mats or knots that do form with a brush or comb and a bit of gentle elbow grease. The average lifespan for a Pekingese is on the order of 12 to 14 years. The primary health issues to be aware of are those that “dog” flat-faced breeds in general: breathing problems as well as afflictions of the eyes, which aren’t as buffered from airborne irritants or low-hanging obstructions as those of a standard longer-nosed dog. 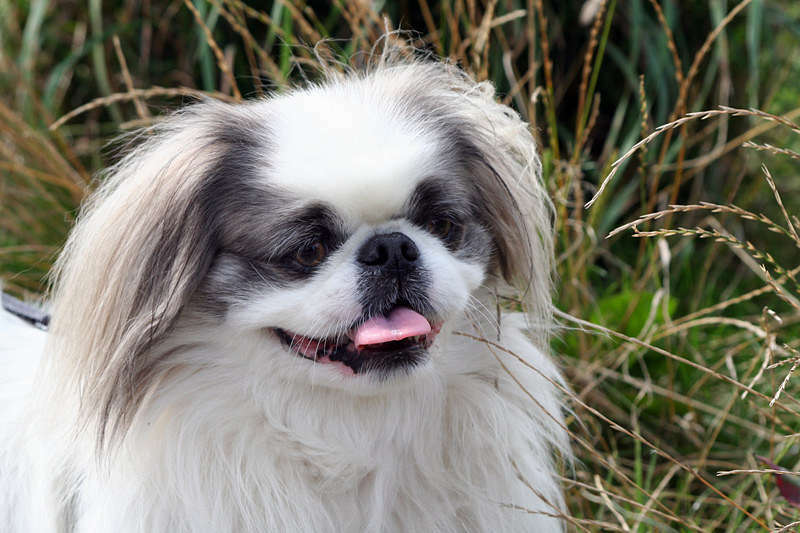 Pekes are also quite temperature-sensitive – vulnerable to overheating in particular – and can suffer from obesity if their owner neglects their minimal exercise needs. Pekes are pampered and pretty sedentary toy dogs by blood, and have very modest exercise demands. The American Kennel Club recommends about a half-hour of exercise each day. It’s important to keep close tabs on your Pekingese during walks or playtime to make sure the exertion isn’t causing wheezing, gasping, or other breathing complications; the Peke may require cool-down periods throughout, and certainly afterward, plus lots of water. Pekes are smart and independent-minded dogs that not uncommonly exhibit a stubborn streak during training sessions: be forewarned. Then again, what else would you expect of an emperor’s doted-on pet?